A quarter of a million more homes are expected to face significant flooding by 2035 because of a shortfall in funding, an independent committee says. The Committee on Climate Change's (CCC) report says that government is not raising spending in line with projected changes in our climate. The report says spending plans are £500m lower over 25 years than the Environment Agency believes are needed. 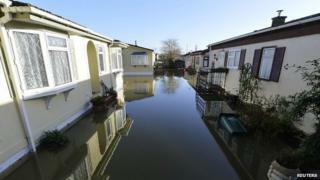 But the government said more was being spent on flood defences than ever. The independent CCC analyses publicly available figures for spending on floods. Environment Secretary Owen Paterson has repeatedly claimed that the government is spending a record amount on flood defences, but the committee says this is only true if you do not count inflation, and if you include spending on flood defences by local authorities. It said: "Taken alone, central government funding will be less than it was over the previous four years." The CCC suggests that local contributions to flood defences will need to rise and keep rising to make up the shortfall. The committee’s main aim is to assess the amounts that will be needed to climate-proof homes. Projections of future rainfall are notoriously difficult, but it is anticipated that precipitation may be more erratic and come in heavier bursts. The Environment Agency estimates that to hold the number of properties under risk at the same point over time, spending needs to increase £20m a year for 25 years. To reduce the number of homes at risk needs an extra £50m a year. “Even with the rise in external contributions (from councils), spending plans are set to be more than half a billion pounds below the amount EA estimated,” the report said. A Department for Environment, Food and Rural Affairs (Defra) spokesperson said: "We are spending £2.3bn on flood defences and along with partnership funding this is more than ever before. "We have secured a historic six-year settlement on capital spending for flood defences. From 2015 we're spending £370m on building new flood defences, rising to over £400m in 2021. "In addition we have provided the Environment Agency with an above-inflation increase of £5m on their floods maintenance work in 2015/16." A senior member of the Environment Agency told BBC News that the real area of concern was revenue spending for maintenance, rather than capital spending on new defences. “We are building more and more defences but the budget for maintaining them is being squeezed,” he said. Other critics have complained that the government is failing to grasp the opportunities offered to trap water in upland areas and in towns. Another question is raised in the CCC’s report over the role of local authorities. They were given £129m by government for their responsibilities under the Flood Water and Management Act – but the cash was not ring-fenced, and councils are spending more than half of the cash on activities other than flood risk management, the CCC says. Two major data sets show that 2013 was among the warmest recorded since 1880. Nasa scientists rate it joint seventh, NOAA researchers calculate it was the fourth warmest. Nasa say that with the exception of the extreme El Nino year of 1998, the 10 warmest years on record have been since 2000.